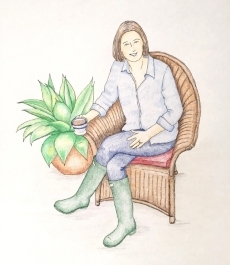 You must be a Muddy Boots Plant Tags user with either a Paid or Free Plan. Once you have an account, you’ll find Weather Records under the main pull down Menu in the upper right hand corner. Start by choosing Fahrenheit or Celsius and Inches or Centimeters under EDIT SETTINGS. Once you’ve editing your settings, you don’t need to do so again. Then add a Weather Record by clicking ADD A RECORD. Once you have some data accumulated, you may look at your data in several ways. You may sort your Weather Records simply by clicking on the header of each column including Date, Rain, Snow, High / Low for either temperature reading. 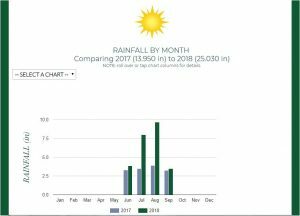 RAINFALL BY MONTH summarizes your rainfall by month for a selected year and compares it to the prior year. RAINFALL BY WEEK summarizes your rainfall by week for a selected year, compares it to the prior year and displays the change in either inches or centimeters. SNOWDAY HISTORY displays all of your recorded dates with snowfall recorded in inches or centimeters. 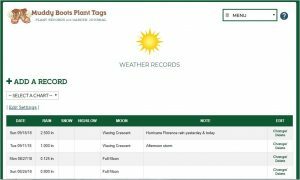 If you’re already a Muddy Boots Plant Tags user, simply select Weather Records from the Menu and get started recording your own weather. If you’re not a user, but would like to check us out, go to Muddy Boots Plant Tags and sign up for the Free Plan.